Last week saw the release of two films MOHENJO DARO and RUSTOM, both of varied genre. This week sees the release of a 'happy' go lucky film in the form of HAPPY BHAG JAYEGI. This film marks the 'return' of the petite Diana Penty, who had been missing from the silver screen ever since her debut in COCKTAIL. Will HAPPY BHAG JAYEGI manage to entertain the audiences… let's analyze. HAPPY BHAG JAYEGI starts off in Amritsar, where happens an Indo-Pak agro conference. Presiding over this crucial conference is Javed Ahmed (Jawed Sheikh), the ex-governor of Pakistan, who wants his dearest son Bilal Ahmed (Abhay Deol) to enter politics just like him and 'change the history of Pakistan'. Even though Bilal's heart lies in becoming a cricketer, he sacrifices his professional desires for the sake of his father. As the conference gets over and Bilal reaches his home in Lahore (Pakistan), he is shocked to see a mysterious fruit 'moving basket', which then, turns out to the hideout of effervescent and free spirited Happy (Diana Penty). When interrogated, Happy reveals that she had run away from her wedding with the local corporator Daman Singh Bagga (Jimmy Sheirgill) in Amritsar, because she is actually in love with Guddu (Ali Fazal), but her parents have opposed to their relationship. At the same time, she also confesses that, even though she was to run away from her marriage, her landing up in Pakistan was purely accidental and totally unplanned. Amidst all this, Bilal Ahmed also lands up falling in love with Happy, despite the fact that he is already to Zoya (Momal Sheikh). What happens after that are a series of chases, hidings, kidnapping and confusion across India and Pakistan. Does Happy survive in Pakistan amidst such pressures, and who will she ultimately marry and under what circumstances, is what forms the rest of the film. The film is written and directed by Mudassar Aziz. Despite the fact that the film's screenplay is predictable, it's the treatment that makes the film entertaining. The humour in the film is excellent and works magic in the first half. The second half however slows down due to multiple subplots and romantic angles, some of which seem quite forced. As a director, Mudassar Aziz, who had earlier made the forgettable DULHA MIL GAYA (2010), springs a pleasant surprise in the form of HAPPY BHAG JAYEGI. The way he has presented the film's characters is extremely real and that's what works in the favour of the film. The film, which takes off with an impressive start in the first half, gradually tends to slow down and lag amidst the second half because of multiple tracks. The good thing is that, despite losing its track amidst the second half, Mudassar Aziz manages to get the film back on track towards the climax. Mudassar Aziz needs to be applauded for not just making the film's characters interesting and very relatable, but also for having penned the film's funny dialogues. Even though HAPPY BHAG JAYEGI bears heavy shades (read 'hangover') of the Madhavan-Kangna Ranaut starrer TANU WEDS MANU, still, Mudassar Aziz successfully manages to give this film its own unique flavour. Amidst everything, one cannot but deny the fact that HAPPY BHAG JAYEGI bears the inimitable stamp of 'Anand L Rai' all over it. The USP of the film is that, despite being set in both India and Pakistan, the film doesn't get involved in making any kind of political statement in its narrative. 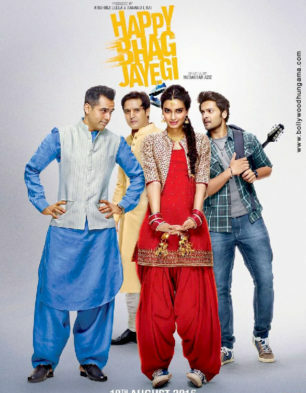 As far as the performances go, as the film's title rightly suggests, HAPPY BHAG JAYEGI totally placed on the shoulders of the extremely talented Diana Penty, who returns to the silver screen after a long gap. While she showed immense promise in COCKTAIL, for reasons best known to her, Penty did not sign any films after that. With a tailor-made script like HAPPY BHAG JAYEGI (with a character that is in total contrast with her character in COCKTAIL), she just couldn't have had asked for more. Even though there are places where Diana Penty strongly reminds us about the spunkiness that Kareena Kapoor exuded as the iconic Geet in JAB WE MET, Diana holds her own by maintaining a strong and distinctive identity. Abhay Deol, whose last release was the damp squib ONE BY TWO, impresses to the core with his role of the Pakistani young politician Bilal Ahmed. His onscreen presence is extremely endearing and the way in which he enacts his character and holds the film is really laudable. Jimmy Sheirgill is decent in his role of Daman Singh Bagga. He plays his part with a lot of sincerity and dedication, which shows in the film. Making her debut in Bollywood is the Momal Sheikh (hailing from Pakisitan) whose approach towards her character exudes superlative confidence. Besides the fact that HAPPY BHAG JAYEGI is her Bollywood debut in which she had been pitted alongside seasoned actors, the conviction with which she handles her character is highly commendable. Ali Fazal, on the other hand, delivers what was required of him in the role of a lover boy. A special mention to Piyush Mishra for having the audiences in splits with his role of the policeman Usman Afridi. The rest of the characters help in moving the film forward. While there is hardly any scope for music (Sohail Sen) in the film, it's the film's background score (Sohail Sen) which impresses and acts as one of the important elements in the film's narrative. The film's cinematography (Saurabh Goswami) is good and deserves to be applauded for having 'shown' Pakistan in an extremely convincing manner. The film's editing (Ninad Khanolkar) is decent. On the whole, HAPPY BHAG JAYEGI comes across as a feel good film that will make you happy. At the Box-Office, its prospects will be rewarding for its makers.